It’s clearly okay to go home, add some tomato juice to your vodka, and call it a bloody mary. And it’s almost certainly a bad idea to go home and fire up your small pot still, to make just a little spirits. 160 Proof? Yikes! Don’t freak over the proof! The high concentration of alcohol makes Twenty 2 HPS perfect for infusing fruits, vegetables, meats, or dairy into vibrant liqueurs or flavored vodkas. Think of the 160 Proof like a very sharp knife in your kitchen. If you handle the knife with respect, it can perform amazing tasks. Same with the High Proof Spirit. It’s “sharp blade” creates infusions in hours, not weeks. Starting in early 2006, Galbiati and Jewell quit their jobs and began the process of starting up their business. While getting a license for a winery or brewery is, relatively speaking, not uncommon, getting the license for a distillery is a much more involved process. According to federal law, a person can brew up to 100 gallons of beer on their own, or 200 gallons if two adults are present in a household. A person also can make up to 5 gallons of wine. Any more than those amounts, and a license is needed. … A person cannot under any circumstances distill any amount of spirits without a license. 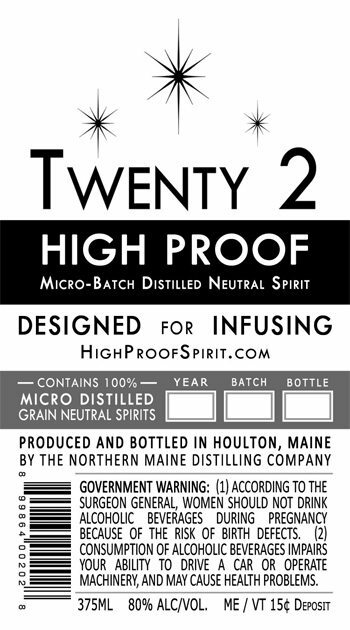 It took Galbiati and Jewell about three years to get the OK to start making Twenty 2. When I first saw the 2011 approval, I was concerned about blowing Twenty 2’s cover, before they were ready, in that the COLA is only a few days old. But they are clearly ready. Of course they have the 2010 COLA, along the same lines, and the 2011 COLA is a public record — but also, Northern has a big website with a lot of information about this idea (plus Twitter and Facebook). On this topic, I will take this opportunity to reconfirm that we have no real interest in publicizing anyone’s news, before they are ready. We make no claim to be journalists. We will be especially careful not to publicize any client news, before the client is good and ready. In the case of non-clients, we may ask, or be guided by generally available information (or the absence thereof). If, as here, the company website has a lot of the same information, it becomes difficult to ascertain what could be sensitive about the COLA.